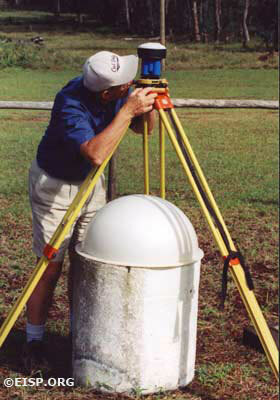 The survey was placed on the UTM (Universal Transverse Mercator) projection zone 12 – the same projection as was used by Cristino et al in Atlas Arqueólogica de Isla de Pascua, 1981). Thus, we provide consistent data. There is, however, a difference between previous maps and our survey. Our map is based on a modern Global Positioning Survey (GPS) using the new WGS 84 figure of the earth. The positions of all moai in Section C, as well as all of those standing outside of it, were surveyed giving a latitude, longitude and elevation above sea level. The attitude of the statues was also recorded – the direction the statue faces, the forward slope and the sideways/lateral slope. Points were surveyed on the quarries sufficient to show the outline of the quarries and other detail, including stepped surfaces, canals, taheta and other features that are clear evidence of carving techniques, methods and quarry use. In addition to our survey map, Cristián Arévalo Pakarati created a hand drawn detail map of each quarry and statue located in Section C. This map, which contains on it the survey reference points, was used to illustrate specific archaeological and formal details of quarries and statues, and will serve as the reference guide for the computerized development of the GPS survey map. 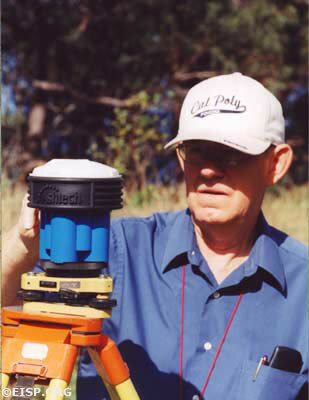 Peter Boniface, Project Surveyor. ©2002 EISP/JVT/ Photo: J. Van Tilburg. Previous investigation had suggested the probable presence of 30 to 35 statues in Section C. Our map shows a total of 54 features, of which 10 are moai heads; 18 are moai; 2 are torsos; 13 are shaped blocks in the process of becoming moai; 4 are possible moai; 3 are possible heads, and 2 are questionable features that may be moai. EISP will continue to document and describe, using the aforementioned digital mapping and adding more sophisticated photographic techniques, all statues in Section D during the next field season. Finally, we will correlate and file all findings in both Sections C and D in computer-based files, which will then be keyed to the digital field map produced in CAD. EISP is the world’s largest and most fully detailed archive of moai descriptive data. It spans a time frame of 20 years and includes over 12,000 visual images; 4,000 graphic images; 46,000 metrics and hundreds of pages of fieldnotes, drawings and maps. All data are filed on CD-ROM and stored in archival conditions. 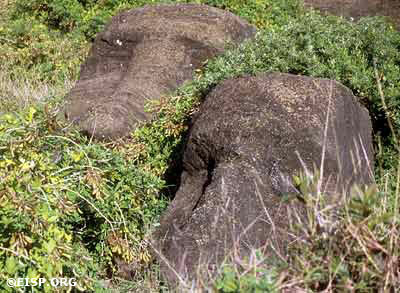 Comparative analyses illustrate that all moai have been subjected to environmental damage. 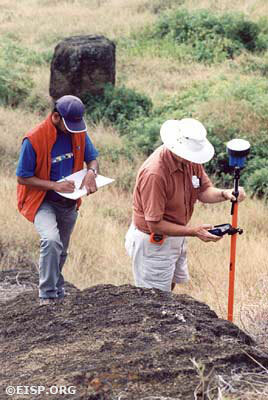 Every effort to restore, conserve or reconstruct moai, in or out of Rano Raraku, requires or depends upon these data. We have made detailed records, both visual and narrative, of the stone condition in the interior. 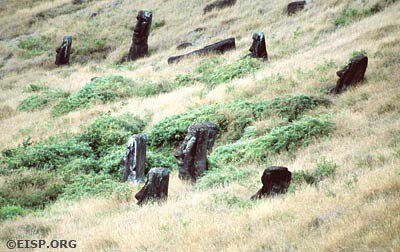 It is noteworthy that grass and other vegetation provide a significant hazard to moai integrity. Non-native chocho weeds smothering two moai in the inner quarry. ©EISP/JVT/Photo: Alice Hom. Overview of chocho overgrowth, innner Rano Raraku quarry. ©2002 EISP/JVT. As suggested by CONAF, during our coming field season EISP will provide a sign stating the nature of the project for the edification of tourists who pass by during our fieldwork. We will accommodate within the project two Rapanui students selected by the Consejo or other agencies. We have discussed with representatives of CONAF and CONADI the preparation of an educational brochure for visitors to Rano Raraku, and this is in process. Finally, our records will ultimately be available on CD-ROM.